If you are a WordPress.com blogger, and using Ubuntu, Automattic made the desktop client for GNU/Linux for you. If this sounds new for you, this so-called desktop client is similar with Thunderbird for email or Firefox for web. You can write posts without using your web browser program. The WordPress.com Desktop App is free software licensed under GNU GPL and the latest version is 2.2.0 for February 2017. 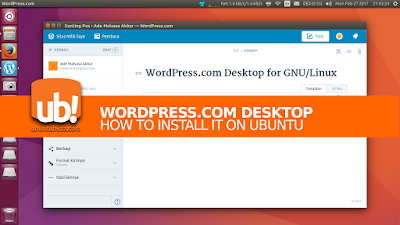 This short article guides you to install it on Ubuntu at any version. Download the .deb package for Ubuntu from https://apps.wordpress.com/desktop/. For version 2.2.0, the file size is 53MB. Change the file name above to your actual file name. When the cursor is back to shell prompt without any error, it means the installation finished. 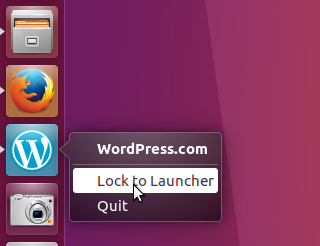 Look for WordPress.com name on your Ubuntu menu. Run it. You will need a WordPress.com account and internet connection to use it. To run it easier, pin it on your desktop Launcher.